One of our most popular summer-time products is the 12oz beer can hugger. We make them for bachelorette parties, weddings, reunions and just about every occasion. I wanted to show you some of the creative designs we’ve made over this past summer to help you to think of ways to use our custom printed huggers. 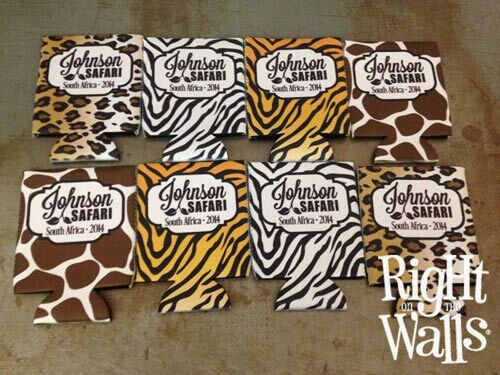 Going on a safari? Or other trip of a life-time? Our huggers make great gifts for your whole group!! 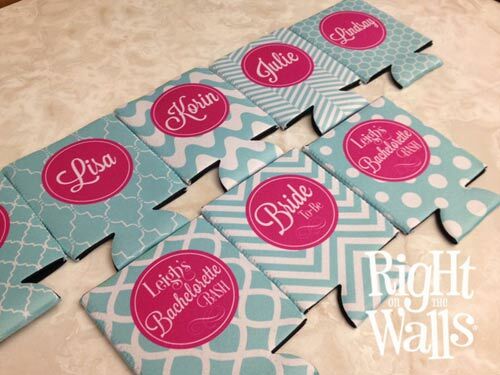 Hand out these awesome personalized can koozie’s for your Bachelorette party! We’ll custom design the huggers to match your wedding. We can even coordinate a personalized huggers set for you! Here we have created matching 12oz can huggers, Red Solo Cup cozy, and a monogrammed wine bottle bag. Please visit our Etsy store for even more ideas & pricing!